A great systematic review by Schwarze et.al. 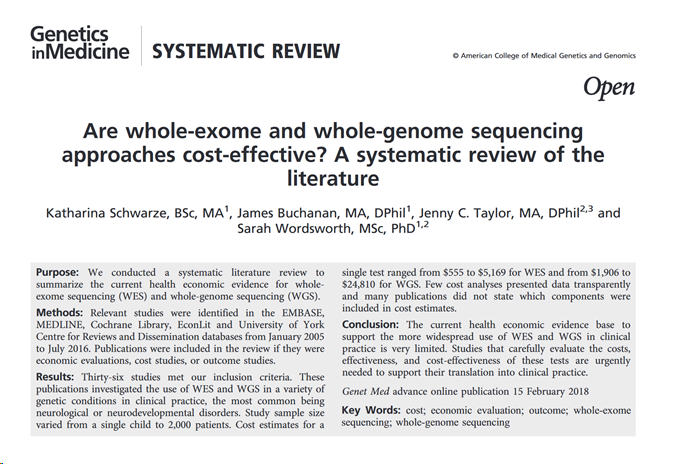 in Genetics in Medicine on the cost benefits of Whole Genome Sequencing (WGS) and Whole Exome Sequencing (WES) in the clinical settings. Doing molecular testing (using single-gene, panel testing, or microarrays) for genetic disorders only results in 50% molecular diagnosis. Many patients will still be going on extensive diagnostic testing to diagnose patients that is both slow and expensive. Although the raw costs of sequencing are dropping in the clinical genetics setting the costs of both WGS and WES are stable and don’t decrease. Diagnostic yield between WES and WGS varies a-lot. With for WES ranging 3 ~ 79% and for WGS 17 ~ 73%. Authors do note that in many of these cases in these studies the patients were hard to diagnose traditionally.